As you might know, my family and I will be on vegetarian diet on specific days i.e. 1st and 15th of every Lunar calendar month due to religious belief. Even though we are not a strict vegetarian (we take eggs), but I am happy to learn an eggless cake. That way, we can have better religious vegetarian diet for totally avoiding egg intake, even for my dessert time! Of course, I don’t bake this just for my vegetarian diet. This cake is absolutely perfect for normal days, too! I had this freshly baked cup cakes served warm, and it tasted even more delicious! Seriously, eggless cake is not as fragrant as the normal ‘egged’ cake. Perhaps, it is my personal preference to taste the egg in cake (winking smile).. 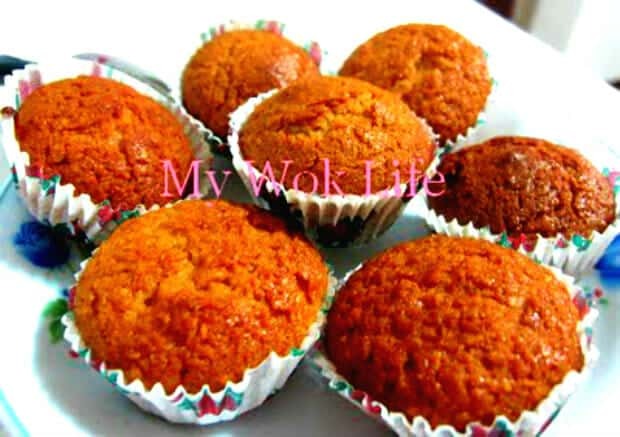 However, as an eggless cake, this recipe is definitely a delicious and healthy one! 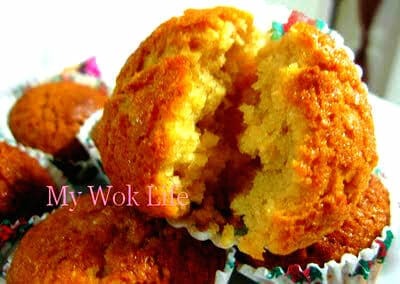 Texture of an eggless cake resembles a little like “Huat Kueh” (发糕), Chinese steamed cake, but no worries, this cup cake has pleasant texture. Its texture is moist, cottony soft inside and crisped on the surface. It’s flavoursome with interesting bites of almund nuts, too! Topping: *Optional, and I did not. 1) Mix ingredient A together in a large mixing bowl. Whisk (or beat with electric mixer) till sugar dissolve will do. 2) Mix ingredient B together, and add into mixture A. Stir well with a whisk or beat at low speed, till all ingredients well combined. 3) Preheat oven to 180°C. Line each cup cake mould with paper cup of appropriate size. Pipe or scoop cake mixture into cup cake moulds, and bake on centre rack, for 20 minutes. 1 tiny vegetarian almond cake counts about 35kcal. If you are not serving young children, I’ll recommend coffee flavoured almond cup cake. Add 1 teaspoon of coffee essence instead of vanilla together with other ingredients A and combine well. I made it before and it tasted superb! Tips: If using 7″ baking tin, set oven to 170°C and bake on centre rack for 45 min to 1 hour. * No pre-roasting required for almonds used to top on the cake mixture. * Piping of cake mixture – if you do not have a proper cake pipe, use a food plastic bag and cut a hole at the tip. 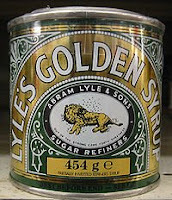 * Golden syrup package in a small can, can be easily found at supermarkets or baking supplies stores.